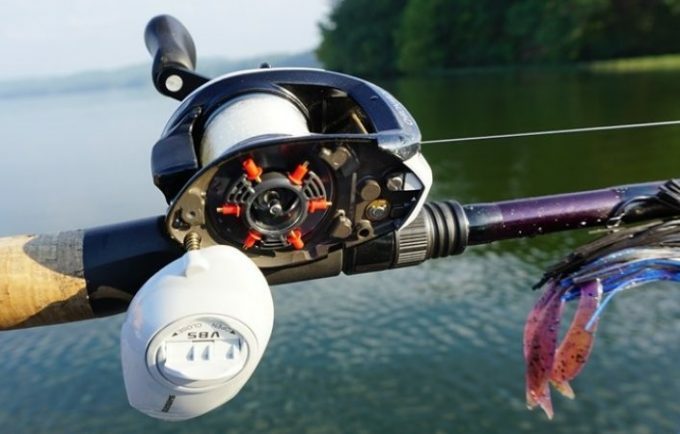 We all know that the best baitcasting reel on the market isn’t a tool only meant for anglers who have a lot of experience, but for anyone who wants to be more in control when fishing. 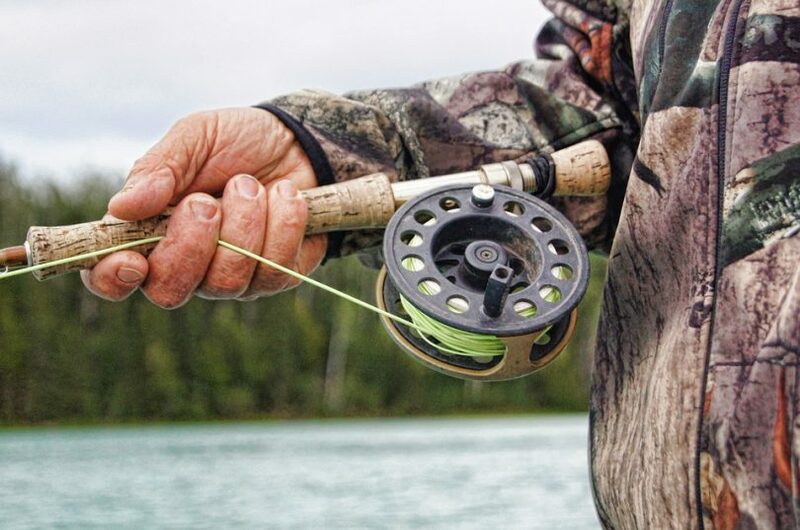 Since the spool starts spinning immediately after casting, you do need a bit of patience and strength to stay on top of things, but the main advantage is achieving increased fishing accuracy. However, you can’t do that unless you pick something that works for you, whether it’s a baitcaster or a spinning reel. Both of these tools have different characteristics which basically depend on your purpose. So we’ll discuss them below, right before letting you know which our top 7 reel picks are. A baitcasting reel is a very useful instrument, as long as you know how to choose one that perfectly fits your needs. That’s why choosing one must be done after knowing all the important features, as follows. 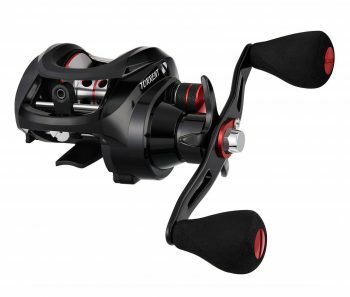 One of the main things that you will have to think about before buying a baitcasting reel is the amount of usage that it will go through as well as the conditions in which it is going to be used. 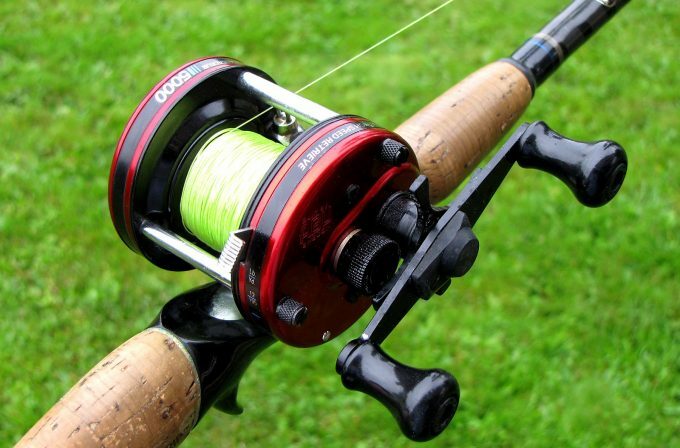 That being said, if the reel will see a lot of use in harsh conditions you will want to go with a shielded model, it the usage is moderate and the conditions are mild then you can go with an unshielded one. You’ll find that baitcasters are also classified regarding their right or left handed use. While many people choose a right-handed casting reel because they’re right-handed themselves, you only use your dominant hand at first when making the cast. 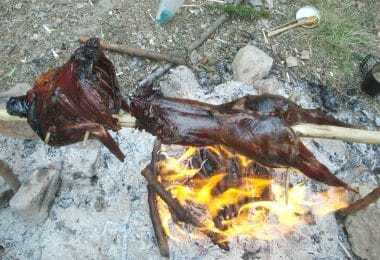 Cranking is done afterward with the left hand and you can’t change the handles. Spinning reels may be considered better here because they allow for the swap to be made. 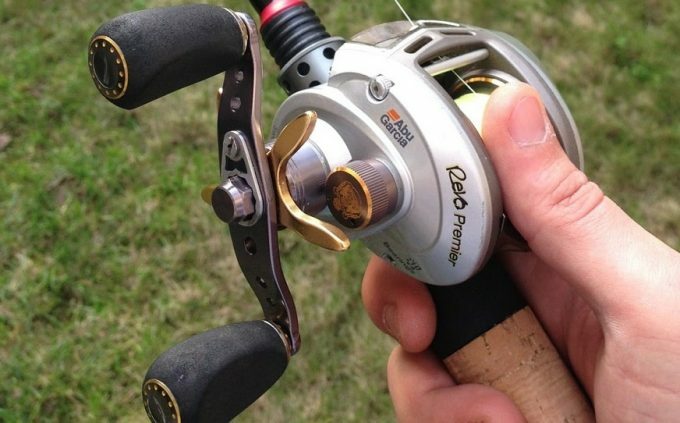 So if you’re really not ambidextrous at all, choosing a spinning reel may be better. Smaller fish like bass or crappie: get a low-profile one. Since the round-profile baitcasting reel is more appropriate for catching bigger fish, its advantages relate to this size. Therefore it can employ more and heavier line for longer, as well as be used to throw a bigger bait. On the other hand, the low-profile baitcasting reel is more ergonomic, easier to use and somewhat more popular because it doesn’t hurt your hands. Basically, if you’re out fishing larger fish for a lot of time and you’re used to doing this frequently, a round-profile baitcaster is a better pick. When it comes to the topic of brakes, there’s no way you can ignore the type of system you choose because it can make the difference between dealing with the hellish backlash or not. So if you don’t want the line to become all tangled up after the lure stopped because the reel keeps spinning, choose the system that seems easier to operate from your standpoint. To adjust the speed with which the reel is revolving, you’ll find a big knob on its side that should be tightened properly. Once you do that and the reel disconnects, the lure falls down because the reel doesn’t revolve anymore. Of course, if you have a bigger lure, you need more tension and therefore a tighter seal of the knob. Employ the pins located in the side plate to brake: push them out to make the reel stop spinning. Employ magnets to slow the reel from spinning. Are adjusted by the side tension knob. It all sums up to fine tuning and how you can do it better: some believe that a centrifugal brake system allows you to get a better feel of the whole thing, while the magnetic system is less instinctive but applies constant pressure for a lower risk of backlash. You’ve probably noticed that all reels have three numbers written on their descriptions. This represents their gear ratio or overall speed. 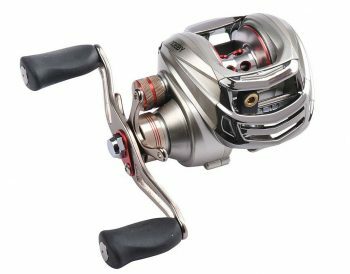 A high gear ratio means that you only push the handle once to retrieve more line because the reel spins at a higher speed. For example, take a common ratio of 5:1. This means that the reel spins 5 times if you crank the handle once. However, this is a lower speed than 6:1 which adds one extra spin to the crank and spins the reel 6 times. This is even lower than the 7:1 speed, which spins the reel 7 times. 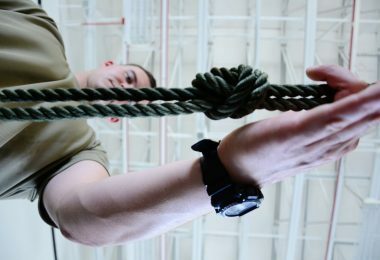 Choosing between a lower, medium and high speed should also depend on your purpose. While many fishermen prefer to go with the middle choice which can be used for fast and slow techniques alike, the bait you have will dictate the need for a higher or lower speed. If you’re fishing in an area with a bigger strike zone and you’re using a crankbait, getting a 3:1 or 4:1 baitcaster is better because you don’t need to get the fish fast. Throwing your cast in a smaller area with a buzz/spinner bait requires a faster speed of probably 7:1 since you need to retrieve your game fast in order to make another cast rapidly. Aluminum for the frame and the spool. Titanium for the line guides. That’s because these are very resistant substances. Of course, if you don’t plan on using your baitcaster for lots of fishing trips that last a lot, and you’re more a once-a-season type of angler, investing less money in a baitcaster is not such a bad deal. Die-cast metal for the reel. Ceramic for the line guides. These too have some advantages, because they’re lighter and sometimes easier to hold and use. However, they can get damaged faster. Also, look for higher quality ball bearings that are shielded or sealed. It’s better than having lots of easy to break ones. And if you’re interested in additional comfort, pick a rubber handle – it’s softer and thus gentler on your hands, but still allows for a firm grip. After reviewing all the above criteria for choosing a good baitcaster, it’s still important to try some out especially if you’re new to this. The theory is one thing, but you definitely need to get the right feel in your hands and get acquainted with your tools to make sure they’re the right fit. Rated 4.4 stars, the KastKing Royale Legend Baitcasting Reel is one of the high-quality baitcasters you can find. First off, it’s left-handed, but you can acquire the right-handed version for the same price if you don’t feel comfortable casting with your left hand. It’s better used for fishing in small areas when you need a high speed to retrieve the fish and cast the line again because its speed is pretty high at 7.0:1. Besides, it’s low-profile which means it’s intended for catching smaller fish that live in shallow waters. You won’t alert them either since this is one of the silent baitcasting reels on the market. It’s also manufactured from good materials, like precision cut brass for its gear structure, and carbon fiber for its drag system so you can get approximately 17.5 pounds worth of drag. The 11+1 ball bearings are shielded, and resistant to corrosion because they’re made from MaxiDur. That accounts for a smooth casting and retrieve, as well as increased durability. The spool is made from forged anodized aluminum which is yet another strong, but light material. When it comes to its brakes, you don’t have to ponder the advantages of centrifugal versus magnetic, because this has them both, giving you better control of the reel. Related: To make things easier for anglers all over the world, KastingKings also makes it possible for them to purchase the KastKing SuperPower Braided Fishing Line. This 4.4 star PiscifunLow Profile Baitcasting Fishing Reel is another example of a good, ergonomic baitcaster. That’s because it has a low profile that works well for maximum comfort and for catching smaller fish. It has a medium-high gear ratio of 6.3:1 which means you can use it for various purposes and in different areas that require either a faster or slower reeling speed. Either way, you’ll be pleased with its performance also because it doesn’t make much noise so the fish won’t hear you cast the bait. This is a right-handed tool, meaning you’ll cast with the right and crank with the left, but you’re offered the option of getting the left-handed version for the same amount. The materials themselves are very high quality. The 12 ball bearings and the roller bearing are all manufactured from stainless steel, which is a light, yet sturdy material. There are also 2 NMB bearings imported from Japan, which are made from a good material that renders them 4 times more pricey than the usual bearings. Basically, this will help you cast and retrieve in a sleek manner, for a long time. The two color anodized aluminum forged porous spool is another component that accounts for this baitcaster’s strength and durability. 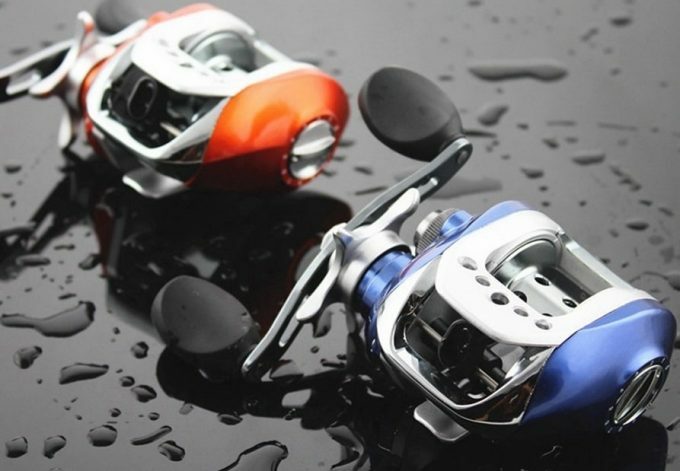 As opposed to the previous item, the Piscifun reel only has a magnetic brake system, which applies constant pressure to brake, thus offering a mechanic accuracy to the braking system. Related: In order to make the fishing experience even more pleasant, the good people at Piscifun also make the Piscifun Aluminum Fishing Pliers available for purchase. The 4.6 star Abu Garcia Max Low Profile is another good example of a low profile, ergonomic tools. With a 12 lbs/ 145 yds mono spool capacity and 30 lbs/ 130 yds braid spool capacity, this item was specially designed for power fishing and use of rather aggressive techniques. It’s a left-handed tool, and you don’t have the option of buying the right-handed version so you’ll have to cast with the left and crank with the right. But since it has a pretty high 6.4:1 gear ratio, you’ll be able to crank pretty fast. The materials used make it durable, lightweight and pretty sturdy. For instance, the ball bearings are made from quality stainless steel which accounts for a slick maneuvering. The Spool is manufactured from machined, double anodized aluminum, thus rendering it a strong tool able to withstand a more aggressive fishing style. The frame and side plates are formed from graphite, which is a lower quality material than aluminum, but still lightweight and well performing. Plus, the brake system is magnetic, so you’ll be able to apply a constant pressure when you want to stop the spool from revolving. 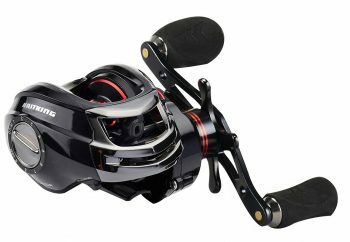 Related: Abu Garcia is all about alternatives and having a choice, which is why they also offer the Abu Garcia BMAX3-L Silver Max Low Profile Fishing Reel for anglers that want to have choices to choose from. 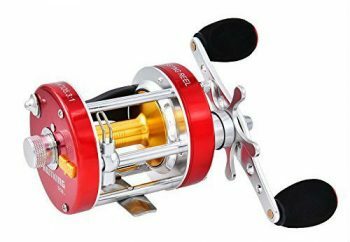 This 4.5 stars KastKing Rover Round Baitcasting Reel can be found in different sizes: 40L, 50L, and 60L which accounts for the price variation. This is the left-handed version, but if you’re not comfortable with throwing the cast with your left hand, you can get the right-handed option. Either way, it’s a good reel for bottom fishing or catching bigger fish, because it has a round profile. Another reason why it’s good for this purpose is the strength and durability of the materials: the side plates and spool are manufactured from hard anodized aluminum, the gears are made of precision machined brass, while the worm, the shaft, and the ball bearings are forged from stainless steel. This will give it extra protection against corrosion, as well as more power. The carbon fiber drag system also renders it a powerful tool, with a smooth drag of 20 pounds. The grips are manufactured from nonslip EVA that accounts for a reduced fatigue and an increased comfort, as does the thumb bar spool release to which anglers have easy access. Besides, the brake system is centrifugal, meaning that you’ll be able to use your instincts when you brake and apply the line pressure however you feel is right. Related: The good people at KastKings care about an angler’s comfort, which is why they make it possible for them to also purchase the KastKing Pioneer Polarized Sport Sunglasses. 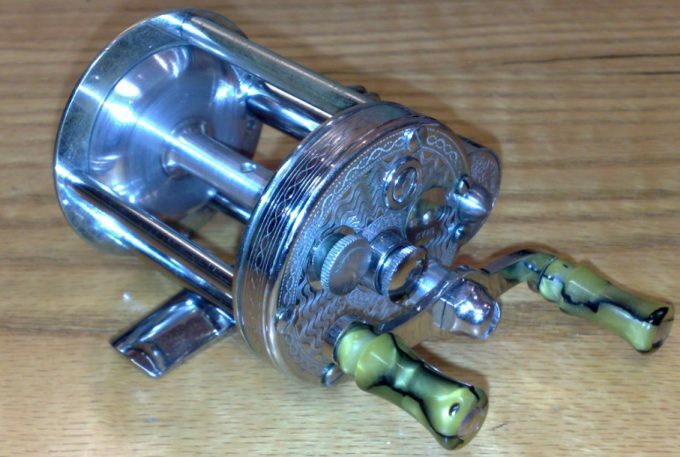 The 4.7 stars KastKing® Orcas Metal Spinning Reels come in different sizes. The models are Orcas II 2000, 3000, 4000, and 5000 each of them weighing between 10 to 14 ounces and with a gear ratio of 5.2:1. That’s a medium speed which allows for versatile fishing, either in smaller or larger areas of water. However, the maximum drag varies between 20 to 28.5 pounds depending on the model, and so does the mono capacity which is situated in a range between 6 to 12 pounds. Basically, you should choose the right model depending on how big the fish are in your area and how much you’re planning to fish. Either way, you’ll still get a pretty strong tool since the Orcas all have a flex-free solid aluminum body and rotor. The handle is also made from CNC aluminum and can be employed either with your left or right hand, unlike baitcasters. 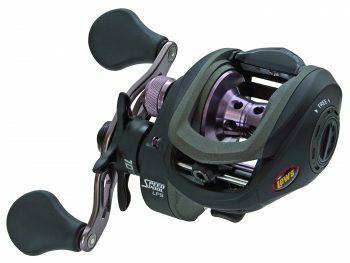 But what makes the Orcas some of the best spinning reels on the market is their ability to cast farther and more accurately thanks to their improved line-lay spool and great power casting lip. The whole thing works pretty smoothly courtesy of the triple disc carbon fiber drag washers, along with the instant stop anti-reverse roller bearing. Related: One of the many products that KastKing has put on the market to help anglers out is the KastKing Fortis Braided Line which helps add a lot more stability and strength into the mix. 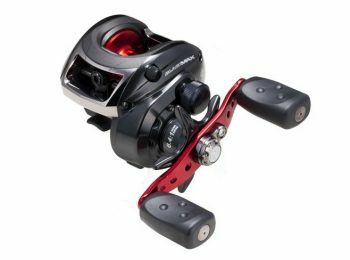 This 4.4 star Lew’s Speed Spool Baitcasting Reel is made from quality materials that allow you to use it for aggressive fishing techniques, but not very often. That’s because the spool is forged from a resistant drilled, machine forged and anodized aluminum, but the side plates are manufactured from graphite. 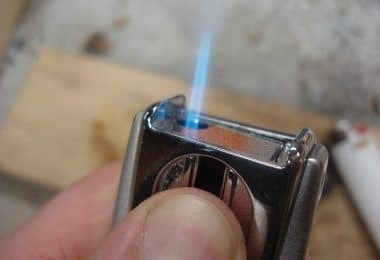 Though they’re easy to remove and allow for better palming, they’re not as resistant as aluminum. On the other hand, there are other stronger materials which account for increased strength and solidity, such as the brass gearing and the stainless steel from which the 10 double shielded ball bearings are made. Even the clutch bearing is made from stainless steel, although it’s one-way with the zero-reverse type of clutch. The reel handles itself is another part made from anodized bowed aluminum, while the handle knobs are ergonomic and comfortable since they’re manufactured with the trademarked custom SoftTouch by Lew’s. Also made from aluminum are the frame and the adjustment knob, which is used to activate the magnetic brake system. This Lew’s Fishing baitcaster can be activated pretty fast considering it has a whooping gear ratio of 7.5:1, and its drag power is up to 10 pounds thanks to its Rulon drag system. Related: For anglers that love going fishing using speed boats, Lew’s makes it possible for them to purchase the Lew’s Speed Boat Bag at an affordable price. 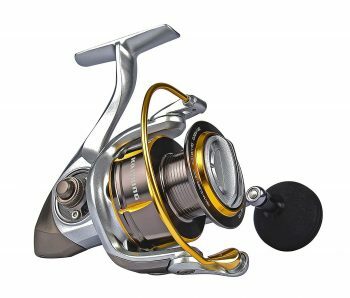 This 4.4 star Noeby Baitcasting Fishing Reel can be used for competitive fishing purposes, seeing as it has a medium to the high gear ratio of 6.3:1. This speed is also rather versatile, and you can use it even in bigger water areas when you don’t need speed as much as you need a decent line capacity and braking force. That’s why this is a good tool to use in these situations too: its maximum braking force is 11 pounds, and the line capacity is 12 pounds. A nice feat is that it has a side plate that can be removed fast thanks to its quick release system, and therefore you can change the spoil pretty fast. Speaking of which, this is made from CNC machined aluminum, a strong and high-quality material. Most materials the Noeby reel is manufactured with are quite decent and account for its long lifespan. For instance, the body is made from nylon plastic, which is strong and durable. The 10 ball bearings and the one-way clutch bearing are made from stainless steel, which is resistant to corrosion but also allows you to cast and retrieve smoothly. The gear itself is made from brass, which is a resistant fabric, and the double handle has very soft knobs for increased comfort and an ergonomic feel. Reviewing all these items has revealed they have one thing in common: they’re all durable and ergonomic, although they fit different purposes. So tell us where you like to fish and how often, as well as what your usual catch is. 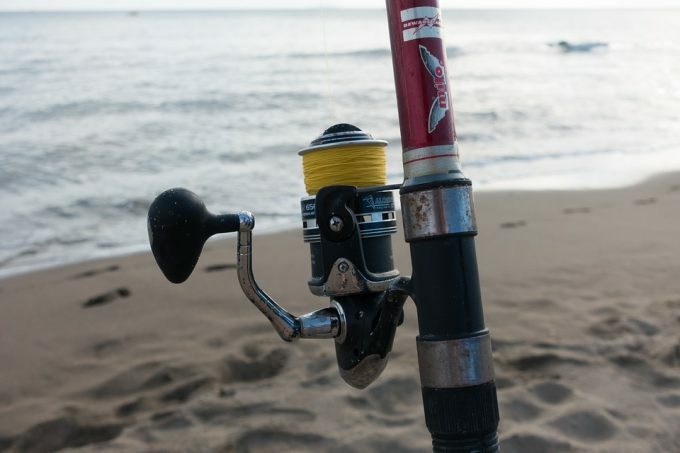 We’re also interested to find out what your favorite fishing tools are, and if you’re using a good baitcasting or spinning reel, let us know which in the comments below.